There wasn't a part of this Grand Canyon vacation I didn't enjoy and that didn't exceed my expectations. From the airplane ride out of Boulder City, to the Bar 10 Ranch, and then the helicopter ride, and then running the rapids on the Colorado River and camping under the stars, it was magnificent! The food was such a surprise, I was shocked at how fresh the produce was and that we had salad and fruit every day. I expected to starve a little bit and instead gained 3 pounds!! 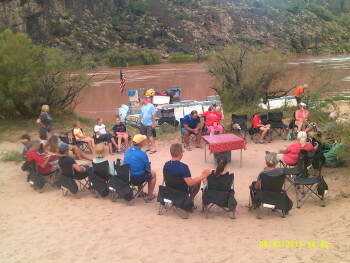 Our guides knew everything about the Grand Canyon, the Colorado River, and the flora and fauna, so we were entertained too, not just by getting soaked in the big water, but also when we were floating and enjoying the serenity of the experience. I was very impressed by how well our group got to know each other so quickly and how much we all seemed to enjoy everyone's company. I'd travel with any of those people again, even the kids. My picture is one of our social circles in the evening, because this part of the trip was way more fun than I had expected, and after the rapids my favorite part of the trip.